Yep. You read it right. After watching this 10-minute clip my heart is hurting and my head is confused. I’m even more sad to report that this happened in Atlanta, GA. At this point, you have to be a fool if you’re anything other than white and voting for Donald Trump. No exceptions. The BLM protester was so furious he could barely get his words out. The Trump supporter seemed to be trying to impress his white friends other than giving a good reason on why he supports such a candidate. After naming some of the innocent black teenagers that have been killed the Trump supporter didn’t seem to care. He referred to a white person that was killed as if he were a white man. The way he looked at him made it seem like he was inferior and made my skin crawl. I seriously want to know what type of high school does he attend. I would put money on it that he attends an all boy Christian private school. So much shelter and being uninformed will have you blind in one eye. The only thing I can prescribe to this young man is a semester at Howard University with this level of thinking. 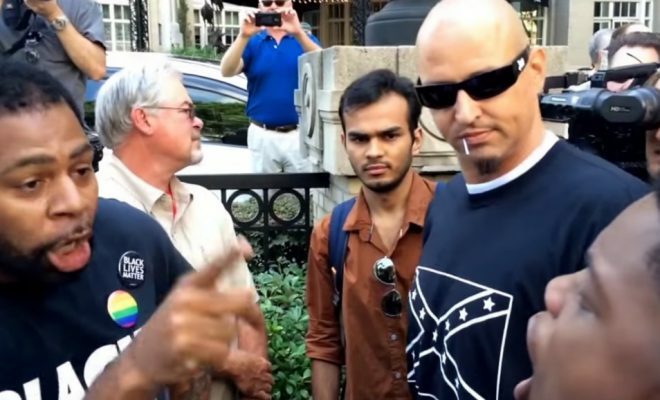 The ne rve of him to stand around while a man in a black confederate shirts stands next to him encouraging him to insult another black man. He has to blind because this scene is straight out of a Dave Chappelle skit. Black mothers & fathers please educate your kids on what is to be a black man in America. What do you think of the video? Did it make you uncomfortable as well?